Make your own polymer clay beads and design your own necklace and earrings, from AMACO. Bulls-eye Canes. Roll a log of Sahara clay 1/4" diameter by 3" long. Flatten Chocolate clay to a #5 setting on pasta machine then wrap around Sahara clay log. Repeat this step with Caramel. Reduce cane by gently rolling back and forth to elongate it to double its size. Allow cane to rest. Repeat the above with Caramel clay in the center, followed by a wrap of Chocolate and Sahara clay. You can alter the combinations to suit your taste. Beads. Measure correct amount of clay according to instructions included in the package. Place ball into middle section of bead roller to create the oval bead. Create approximately 40 Chocolate, 5 Sahara and 5 Caramel beads. Bulls-eye beads. Slice thin slices of cane made in step 1, apply to Sahara and Caramel beads, and roll until smooth. Tube beads. Flatten Chocolate clay to a #5 setting on pasta machine. Using the smaller metal rod from Bead Making Tool Set, wrap clay around rod. Trim off excess and smooth seam until it disappears. Bake clay on rod for 1 hour. Allow to cool and remove rod. Slice clay beads with Polyblade. 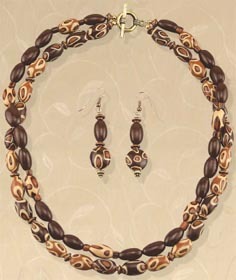 The beads can vary in width from 1/8" to 1/4", they do not have to be exact. Place beads onto pins and suspend on bead baking rack. Bake for one hour at 265°F (130°C). Allow to cool completely then apply FIMO® Gloss Lacquer to all beads. Allow to dry. Stringing. Place a crimp bead onto beading wire. Thread beading ewire through hole on toggle and back through crimp bead. Pull tight and crimp. Strand #1: 3 chocolate, 2 tube, repeat. Finish with crimp bead stringing through opposite toggle. Strand #2: Attach beading wire as above using the same toggle. Beading order: 2 chocolate, 1 tube, 1 caramel bulls-eye, 1 sahara bullseye, 1 caramel bulls-eyes, 1 tube, repeat.